Today, class, we are going to be discussing the thorny issues of indigenous versus colonialist rights, based on the case of England and France. Let us start with the background. The year the world changed (again) was 2025. The United Nations had finally succumbed to fatal illness, falling apart under increasing erosion of the moral principles that were supposed to have allowed the organization to lead the world to “peace in our time”. England, still upset at having lost the British Empire about 100 years earlier, “the blink of an eye” historically speaking, and unwilling to be pulled into a European common market, decided to go for broke: In the absence of the UN and under the guise of preparing to fight Islamic extremism in the Middle East, they were able to build up their armed forces and conduct training exercises without anyone being aware of their true purpose. Thinking that the British would be doing their fighting for them, other nations even provided them with arms and funds. Then, without warning, the English forces crossed the channel and invaded France, while their air force units simultaneously attacked other targets in other parts of Europe. England was once again a huge and successful Empire. They called it New Britain, and in typical conqueror fashion, the English chopped up the defeated nations and rejoined them randomly, creating new provinces with new names. The new political units had English administrators and an influx of English settlers. Heavy taxes were levied on the small numbers of locals who had remained in their homes or had been displaced to other towns within their native lands. Confusion was overwhelming as all the conquered peoples had to master the English language and find new ways of supporting their families. By the year, 3265, enough time had passed for the sting of conquest to have washed away over successive rainy seasons. Children of the vanquished and the children of their children learned the languages of the places of refuge to which their ancestors had escaped, and those who had remained in their native lands had finally adapted to English rule. They had all rebuilt their lives under the new circumstances and pledged allegiance to their Anglo-Saxon leaders in order not to suffer violent suppression and humiliation. By this time, a number of the various provinces had gained independence from the Empire as separate nation-states, keeping the names the British had applied to the provinces they had created, speaking English, and maintaining British culture and manners. They remained affiliated with the UK and looked to London as their administrative guide. The original inhabitants, by now small minorities in their native lands, appeared to put up with the new order. Yet there were a few stubborn souls, both among the dispersed and the remaining, who passed on to their offspring memories of their native lands. They lived in communities together, apart from others, so that they could preserve their former identities. They spoke their native tongues and celebrated their festivals secretly, lest the administration clamp down on them. The strongest Diaspora group was an enclave of French living in southern Italy. Relatively free there, they vigorously wrote books and poems in French, sang songs that had passed from generation to generation and created art that reminded them of their beloved capital, Paris, that was now spelled Periss, in deference to the English pronunciation of the word. The Eiffel Tower dominated their collective memory, even though the landmark was decorated now with the Union Jack and called the Queen Elizabeth Tower. The province in which Periss was located and for which it remained capital was called Gaul. Gaul never gained independence because the British saw it as a threat to their own security. The dispersed French had relative freedom to move about the lands outside of New Britain but they were warned not to try to re-enter what had been their ancestral homeland. Yet some did venture back; they bought land and homes, and they brought with them the solidarity of a community that did not forget its roots. In fact, they strengthened the identities of those who had stayed behind and who were pressured to assimilate with the English. Periodically, things got ugly between the French and the English in all parts of the Empire – they had a long-standing hostility that predated even the dispersal and establishment of New Britain and in this new order, the French were often killed and injured. (In fact, the French were not much liked wherever they were.) But, as strong as the English seemed, the French never gave up on their dream to return home and reclaim their country. By 3300, the French had managed to take back control over a substantial part of their previous homeland in an operation that they called, simply, La Guerre. The English were no longer as powerful as they had been during the days of the original conquest. With growing French strength and determination, they had been able to fight their way across much of Gaul and many descendants of the original English settlers ran off and left their homes in fear of French retribution. This greatly displeased the government in London that did not want to lose control over any bit of the former Empire. They declared these runaways as refugees and, instead of reintegrating them within English society in the UK or elsewhere in the former New Britain, they put them in refugee camps and insisted on their right of return to Gaul. These former residents of Gaul saw themselves as English, called themselves English, and yet, trusting London, accepted the decree as rational and right. Finally, Gaul was freed from British rule and renamed France once more, the spelling of their capital, Paris, also reinstated. French was again the official language of the land. 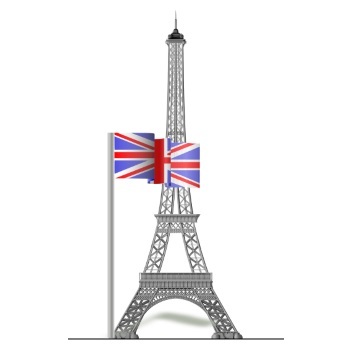 The rest of the world, while grudgingly acknowledging this new member state to the community of independent nations, still insisted on referring to the Eiffel Tower as the Queen Elizabeth Tower, and saw it as an important historical English landmark. The French offered citizenship and full rights to the English who had remained and refused to allow back those who had run away. Given its place in the now largely English-speaking continent, English was also deemed to be an official language of France, even though it was gradually being spoken by a smaller and smaller minority of the population as French made its comeback and those declaring French ancestry immigrating from far and wide. The citizens of the modern State of France, within smaller borders than before the English Conquest, set about to redevelop their country. However, a French-speaking country was not wanted in the midst of the Anglo-Saxon dominated former British Empire. It was attacked from the east and south-west, by troops that rolled through neighbouring provinces and north from the UK. The amazing result was that France won the war and recaptured land within, but by no means including all, of what had constituted 20th Century France before the English invasion. French families moved into the newly liberated regions of their former state, happy to see with their own eyes places they had only heard about in tales told of France of old. They were able to find artifacts dating back to their ancestors on sites that had been bombed during the English Conquest and not yet built over. In spite of their clear connection with the land, the English called this “occupied territories” and insisted it be returned forthwith. About 30 years had passed before the former English residents of the liberated/disputed/occupied territories agreed to call themselves “Gaulans”, something they had considered demeaning and inaccurate until then. In their squalid refugee camps, they held onto the keys of their former residences and passed them on to their children and grandchildren as each generation longed for the day they would be released and allowed to go back to “Gaul”. The rest of the world concurred. Accusing the French of being the cause of instability, not only in the neighbouring provinces, but in Europe as a whole, they clamoured for France to return the lands captured during this latest war, part of which included parts of Paris and lands between Paris and the English Channel, and declared the French to be illegal settlers on occupied territories. The issue of the capital city was also up for international consideration, since the Gaulans claimed Periss as their capital, the Queen Elizabeth Tower having special cultural and historical significance for them. Accused of being colonists (sometimes even by other French citizens), of having stolen land from the rightful owners, they were rejected from many international organizations and conferences and shamed and criticized viciously in the attempt to cajole them to the negotiating table to make peace with their neighbours and allow the Gaulan refugees to return (as a ruse, some said, to get them to relinquish huge swaths of land and to ultimately remove them from the area altogether, a claim other citizens scorned as fear mongering). We all know how this turned out, class, and my questions for you are: At what point, for the purposes of current political and diplomatic decision making, does the history of a nation begin? Is it after the most recent war? Is it 30 years ago? 100 years ago? 200? 2000? If both the Gaulans and the French claimed indigenous rights to the land, then how far back do we go to determine who had indigenous rights? In the case of the English and the French, therefore, who is the indigenous people and who is the colonist? First published in my Times of Israel blog on June 13, 2015.